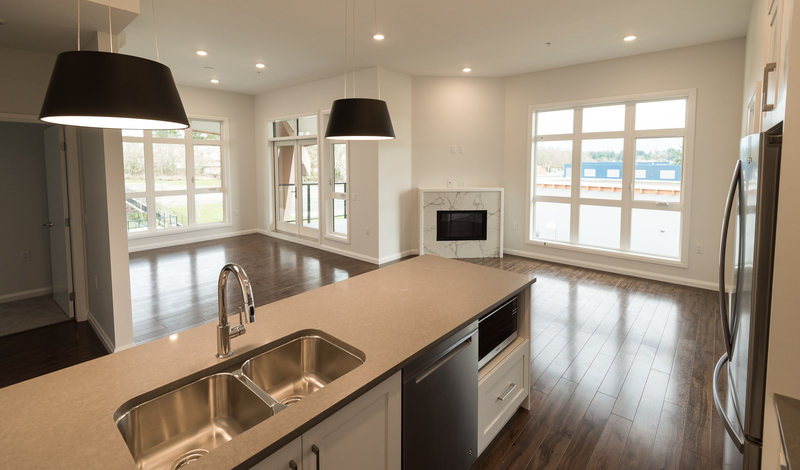 We’re nearing completion of construction at Travino Landing! This beautiful collection of residences will soon be ready for our newest homeowners at Travino. We’ve had the pleasure to welcome many Travino Landing owners for a first glimpse and inspection of their homes in the past two weeks and they are thrilled! Our crews are taking their final laps through each home to paint, polish and finish the beautiful spaces, including the gorgeous kitchen and bathrooms! Let’s not forget the beautiful oversized patios and balconies that will be ready just in time for some springtime sunshine. The common areas and outdoor spaces at Travino Landing are also getting a lot of attention as we head into the final stretch. The newly laid brick pathway that leads to the building lobby will soon be landscaped. Inside, hallways are getting flooring, tile, light fixtures and final paint touch-ups. Travino Gardens is still in the early stages of construction but now that the underground parking is completed – framing for the building is fully underway!